Definitely deserves to be called an all arounder. Does well in pretty much any condition. Make sure you read what I have to say about the paddle. 1 lbs heavier than advertised. Slight variations in weight are normal though. I review a ton of SUPs every season, and there are always some that I’m especially excited to get my hands on. SOL is one of the companies I’ve been following for a while. I think it’s fair to say that they have some of the most interesting board designs and I’ve been eager to see how if the boards were as good as they look. 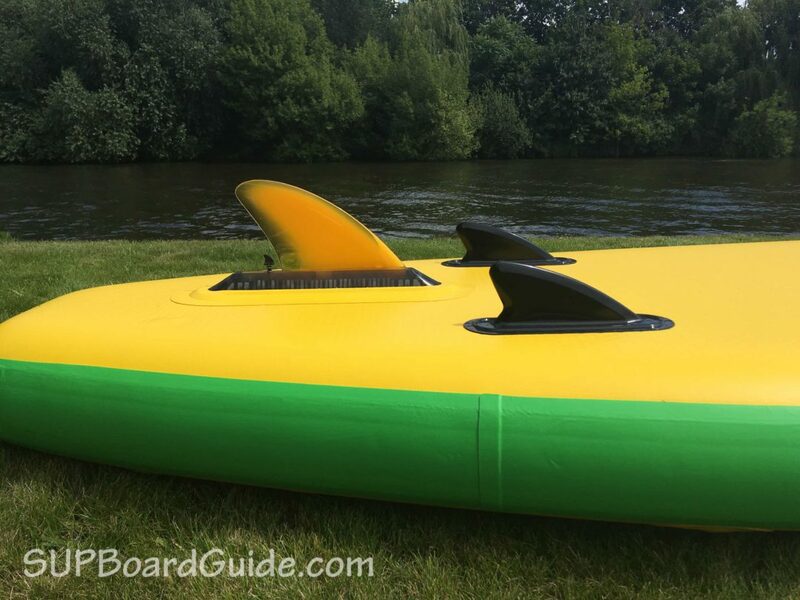 That’s why I messaged Johnny, the owner of SOL Paddle Boards to see if we could setup a board review and indeed we could. So here is my review of the SOLtrain. 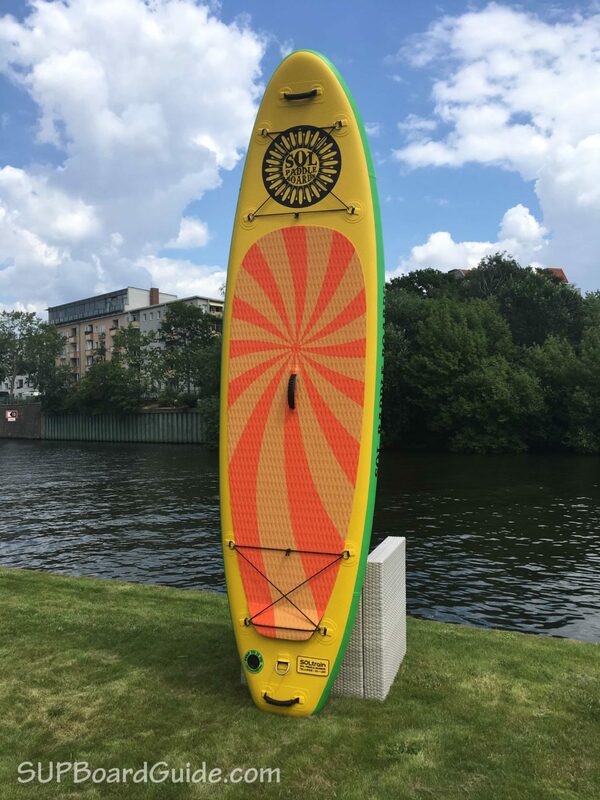 The SOLtrain is an all-rounder with all the added perks necessary to get the most out of whichever activity you choose to do on your SUP. Whether it’s surfing, fishing, touring, yoga or bringing additional passengers, you’re going to be seething satisfaction. Being a beginner, intermediate or advanced rider, it doesn’t matter, the SOLtrain delivers. 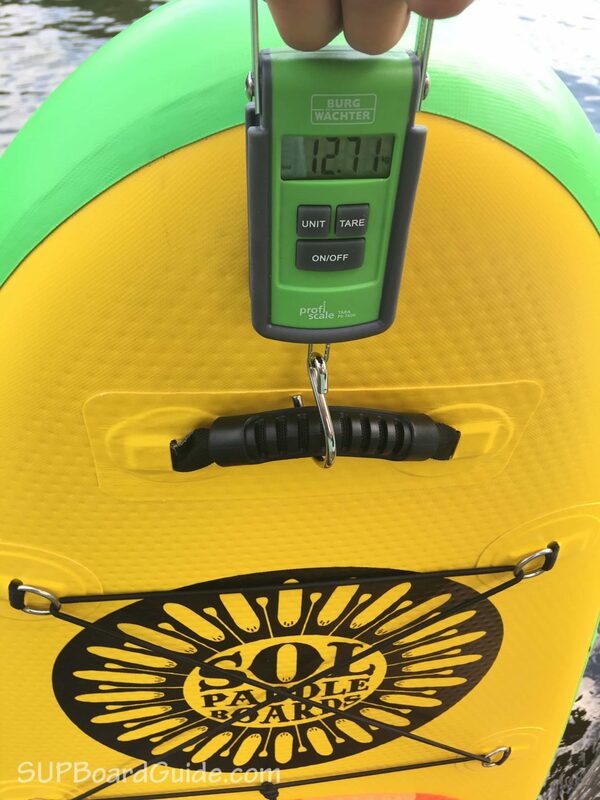 Included with the purchase of a SOLtrain is a 3pc aluminum paddle, backpack, pump, and repair kit. The recommended PSI is 15, making it feel rock solid. 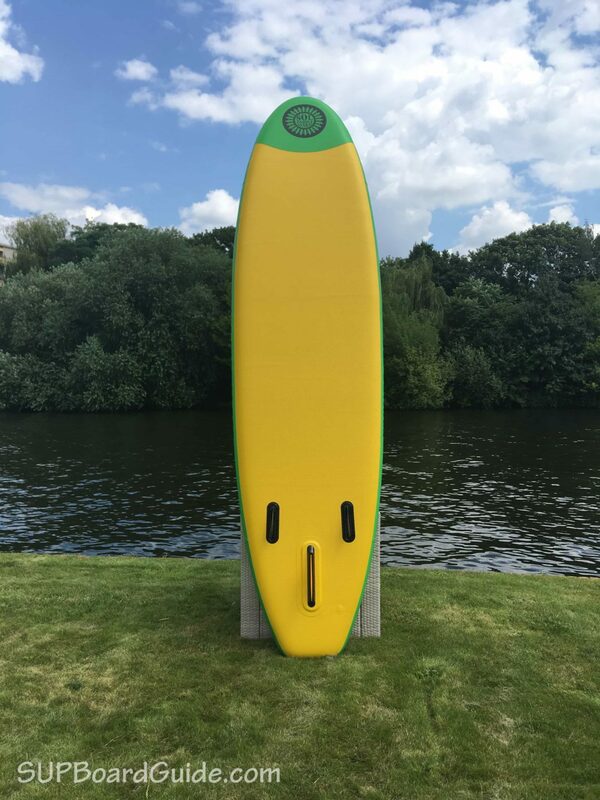 With the amount of SUP’s that are overflowing the market, features are what make a board stand out for us. The SOLtrain isn’t stingy when it comes to features. 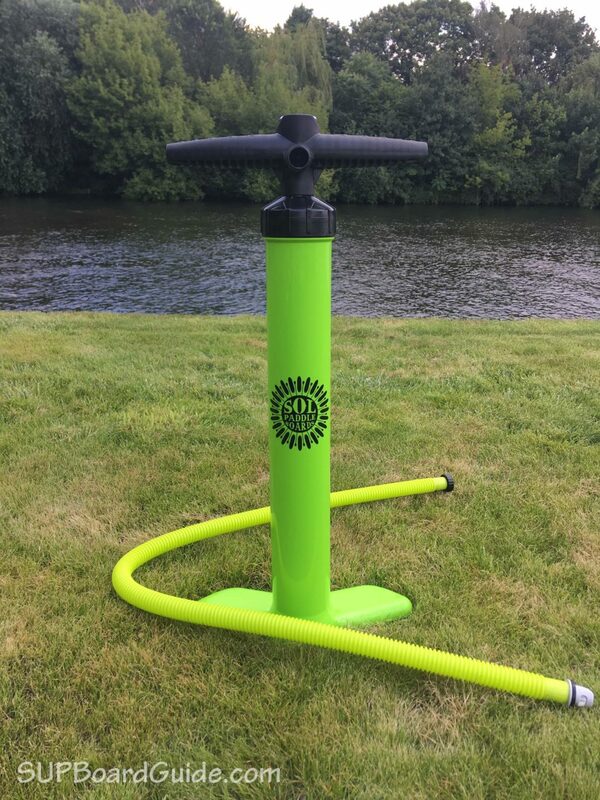 Pump – I found the pump to be a nicer version of the usual dual action pump. The flimsy pin is gone and replaced with a lever (see picture). Even though it’s not quite as nice as Red Paddle Co’s Titan Pump, it’s an upgrade compared the normal dual action pump you get. D-rings + Tie-downs – At the front AND rear of the board – Imagine all the items you can bring and secure with that amount of storage! Most boards only have tie-downs at the front or rear. Having some extra storage space is definitely a big plus, especially if you want to go on a longer paddle. You can also expect longer lasting quality if you’re using the SOLtrain in salt water — the D-rings are non-corrosive. Rear Leash D-ring – Oversized for resilience in the surf. Soft Rubber Hand Grips – Located in the front, middle and back of the board for ease of use and added safety. The handle in the middle is of course standard, the ones in the front and back are missing on a lot of other boards which makes it hard/annoying to carry them or get them in and out of the water at times. I’ve scratched plenty of boards on the pier where I usually paddle board due to missing handles. 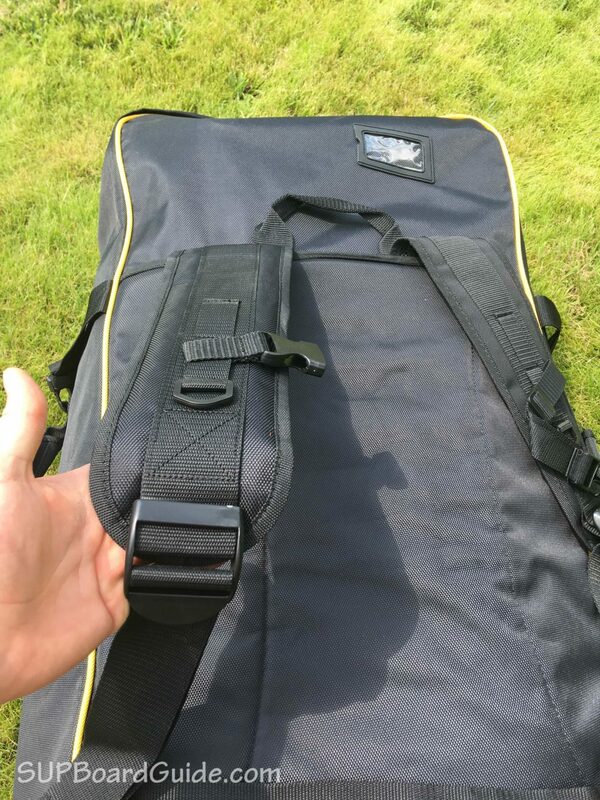 Very well padded, loads of room to pack away/get out your board easily and wheels! Yes, wheels! Perks for travel use. Depending on how adventurous you are, lugging an inflatable SUP in its backpack can be a tiring affair. 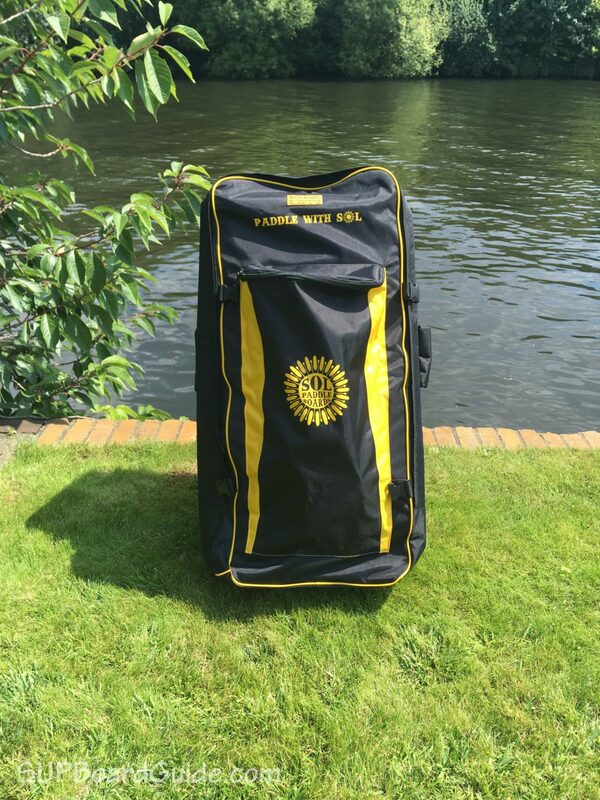 The padding and support make transporting your SOLtrain, not such an arduous process. Included with your purchase is an aluminum paddle which is the one thing I was slightly surprised about. Aluminum paddles are the heaviest paddles on the market, and at a $1000+ price point, you usually see fiberglass or sometimes even carbon paddles. I weighed the paddle and it’s 1130g which equals approximately 2.5lbs. High-end carbon paddles weigh less than 700g. 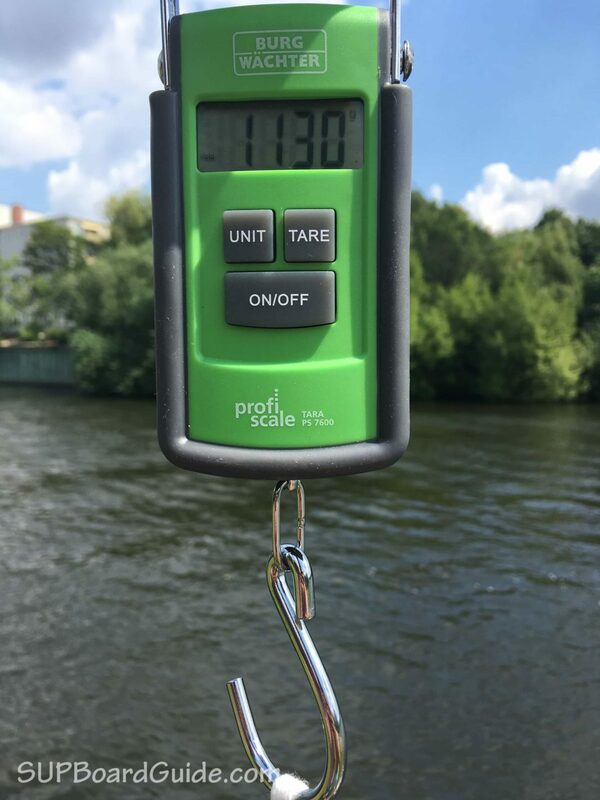 So if you just look at the weight, the paddle doesn’t look great. That changes when you look at the details though. The blade itself is ergonomically designed, the ridges through the blade provide a little more stability in your stroke. Unlike most other paddles, the shaft is slightly oval and not round. 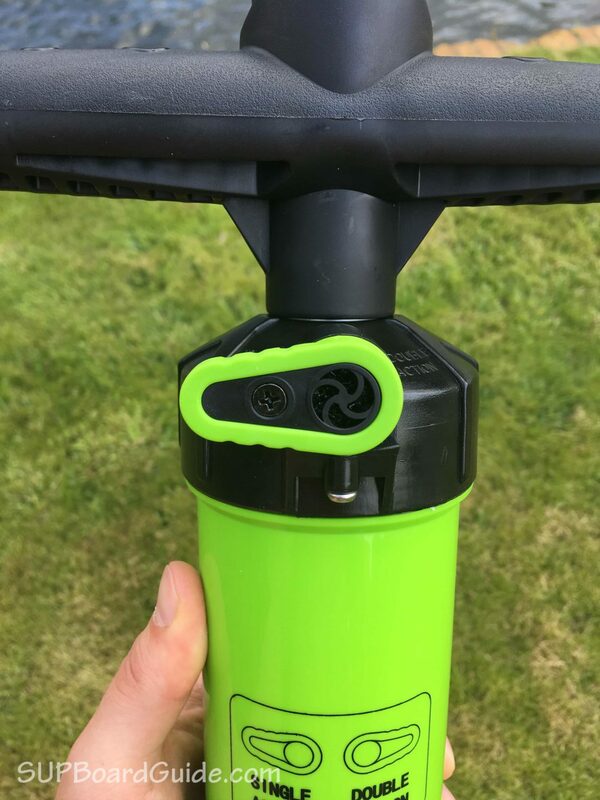 One huge advantage is that this instantly stops the handles from twisting. A common problem you have with a ton of entry-level and even advances paddles is that the handle starts to move and twist at some point. That means you have to stop and re-adjust it. The oval shaft shape makes that impossible. 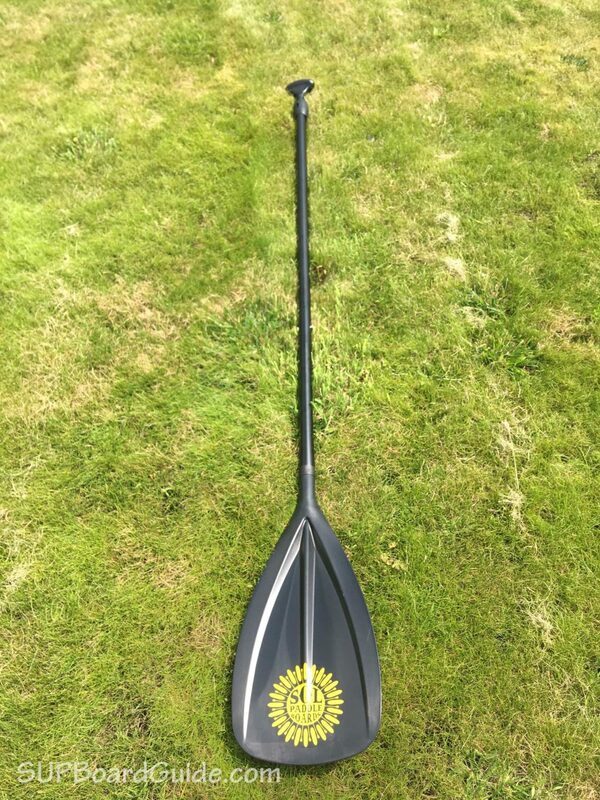 The shape also makes the paddle bend significantly less and adds a lot of stiffness which is great. So yes, the paddle is made from heavy aluminum. However, it does make up for that with a few nifty features, and it’s a lot nicer than many other aluminum paddles from other premium brands. 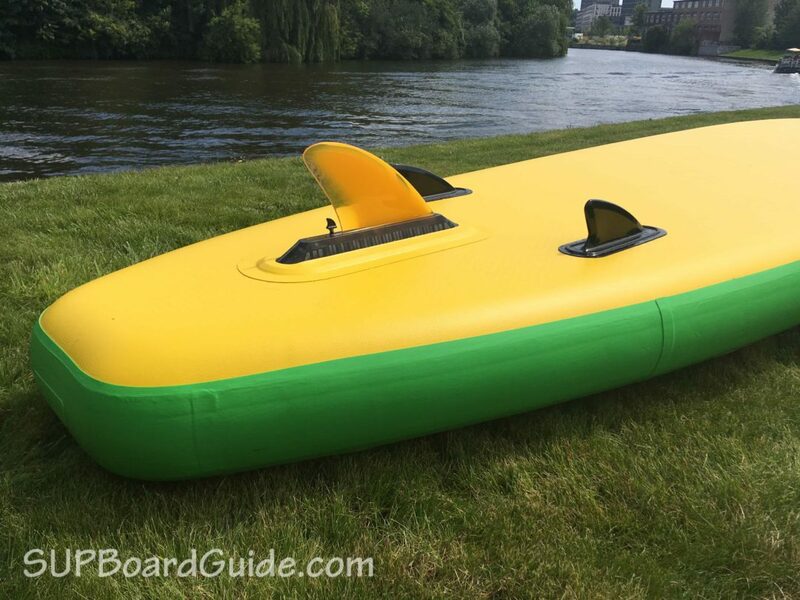 The fin box system (where you place the fins) used on the SOLtrain is the Air 7, it’s a US brand with a brilliant hydrodynamic design (makes you fast!). On offer as optional purchases from Air 7 are a 4.6”, 8”, 9” fins. You can make these purchases via Amazon or buy them on the SOL homepage. However, the Air 7 fin box for the center fin is basically as good as it gets though and still allows for a bunch of different fin setups. It’s all about the funk!! Cool retro design, I love the vibrancy and the fun it brings outside of the standard duo color striped boards you usually see. Addressing board quality, I looked at the board’s makeup vs. market price range. Since the board is more expensive than your usual paddle board, I also had higher expectations. Before I get into it, It’s an opportune time to point out that the manufacturing for the SOLtrain is the same across the whole SOL range. Every SOL board uses the modern drop stitch construction surrounded by two layers of tough PVC. The unique addition to the construction is double reinforced PVC sidewalls with three-layer on the nose cone. That’s as good as it gets making the board basically indestructible. Additionally, a SOLtrain purchase is inclusive of a 3-year warranty with also a lifetime guarantee on all air valves. Again something you very rarely see, and it just goes to show that the company is 100% confident in the quality of their boards. Features + Construction + Price Range (what you get in this price range) — leaves me voting the SOLtrain as high quality. 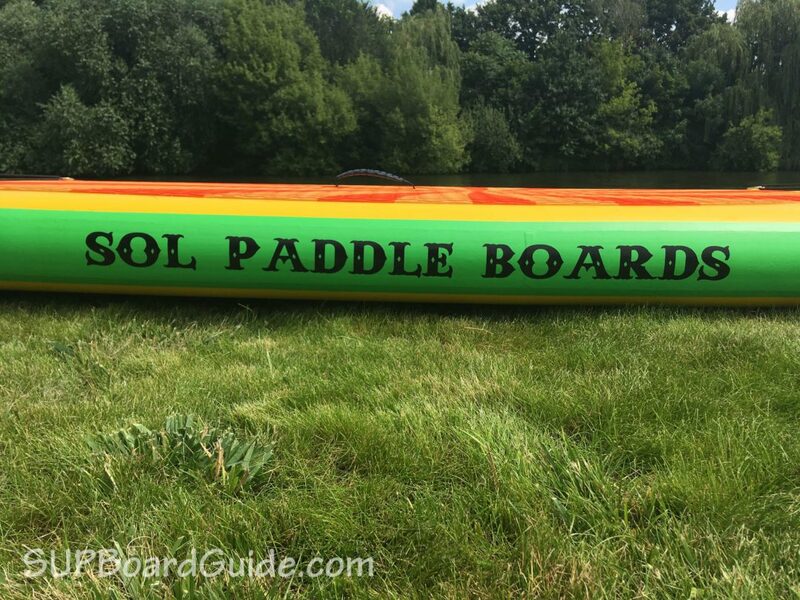 As a beginner you’ll love the stability of the SOLtrain, no more worrying about falling off and more time to focus on improving paddling skills. As a more experienced rider, the same balance is ideal for doing things like Yoga, fishing, choppy waters (white water) or having an extra companion on board. This stability is provided by the boards 34” width and 6” thickness. When I looked at the board stats on paper, I expected the board to be on the slow side, being good for Yoga but not for long distance touring. At 34″ wide the board obviously isn’t a race board. However, it’s a lot faster than I expected it to be. Long distance paddling is also made easier by the storage previously mentioned. Any essentials like water or food, are easily stored and secured. As people progress naturally, they start to steer towards particular styles of SUPing. You might find that racing gets you going or on the other end, surfing your SUP is what gives you your kicks. However, there is many of us who use our SUP’s in a more “general use” way. We aren’t set on becoming a pro in any particular area. Which is why SUP all-rounders exist. 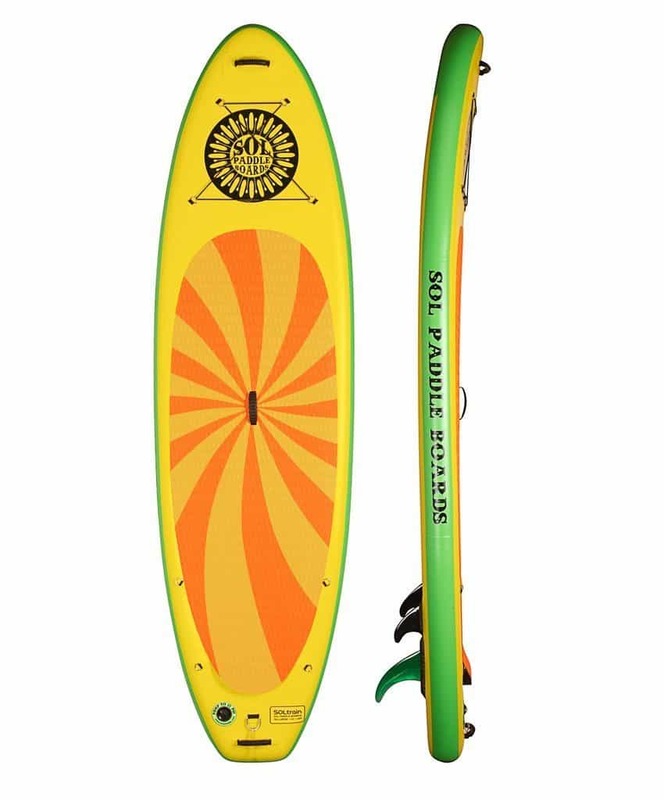 An all-rounder lets you appreciate all aspects of SUPing. 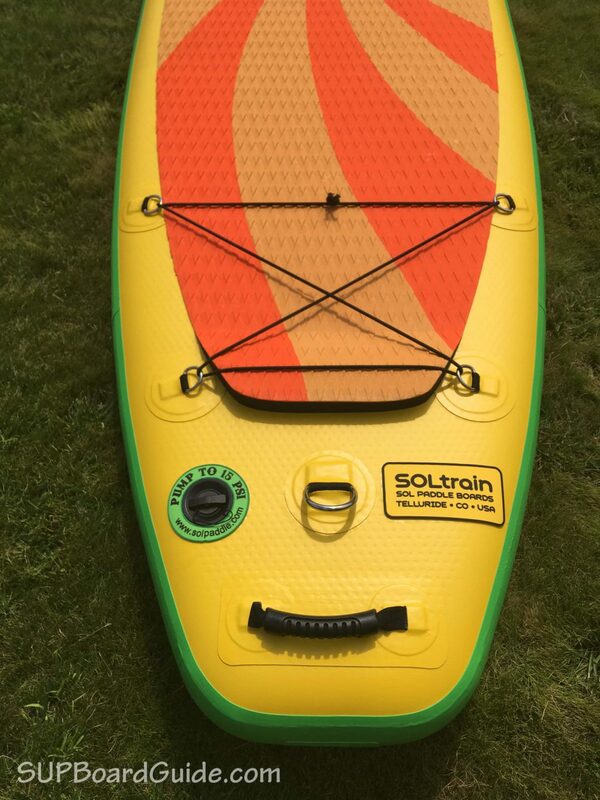 The SOLtrain is a perfect example of a SUP that’s extremely versatile and really deserves to be called “all-rounder”. Little variants like fin setups are what keep you on your toes. The SOLtrain includes versatile options for the fins. If you are starting out I recommend using the three fins – with a large single fin, it will help you keep paddling straight. Using a thruster setup (3 small fins) is excellent in the surf but when you are starting out or in flat water. You’ll probably spend unnecessary amounts of time paddling both sides trying to stay straight. 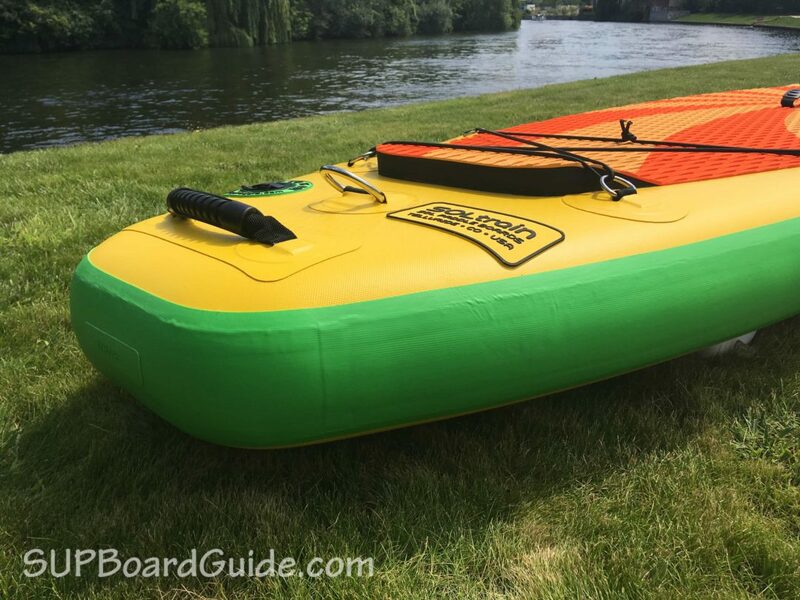 All of this means that you can change the performance of your speed, maneuverability, and stability depending on the conditions in which you are paddling in. Heading to the ocean for the weekend? The SOLtrain handles well in surf given the design of the rocker (turned up nose). Rockers allow you to drop with ease down the face of waves. However, again I wouldn’t suggest taking it out in surf bigger than 2ft. If you are looking to take on bigger waves have a look at my personal surf favorite the Fanatic Allwave. 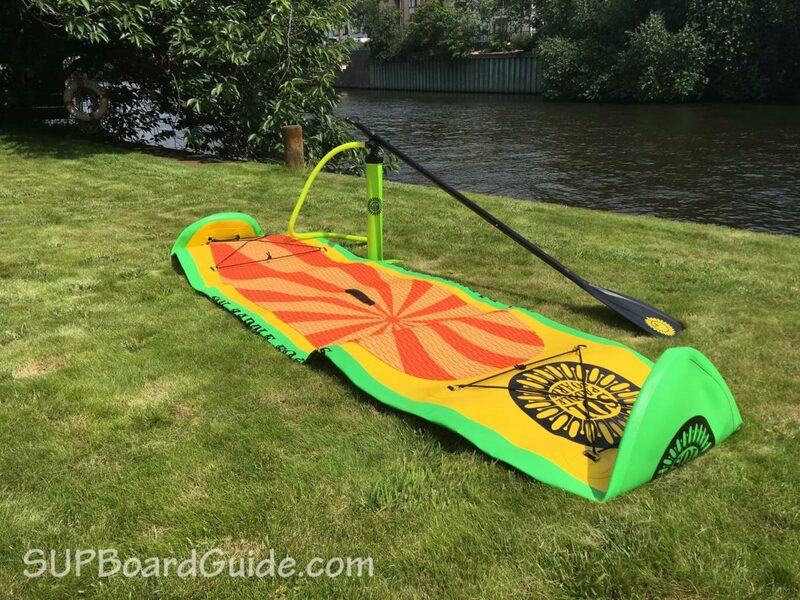 Being an inflatable board the SOLtrain is a perfect companion for anyone who SUP’s in various locations. Due to same location factor, an Allrounder design compliments being an inflatable beautifully. 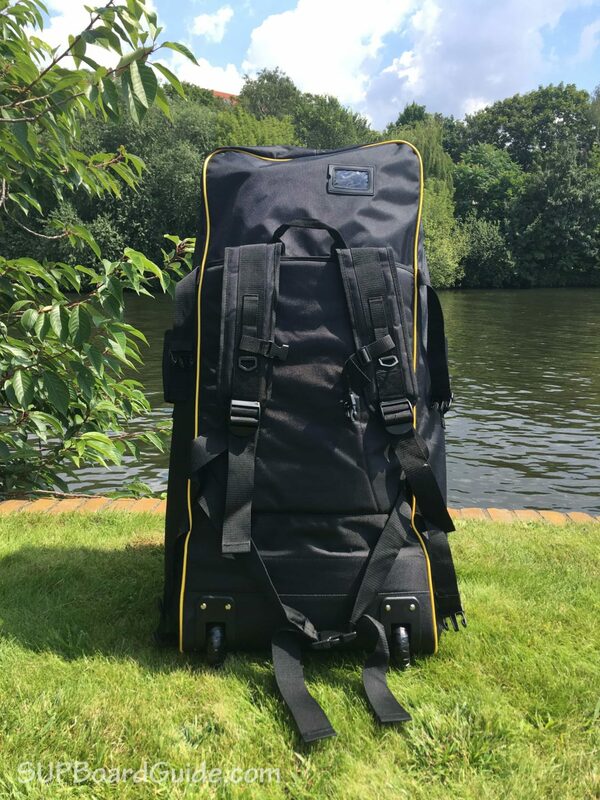 Getting your board to the beach, river, rapids…wherever you go, you will find it effortless compared lugging a hard board around. We have seen a few new to market names leave lasting impressions this year. 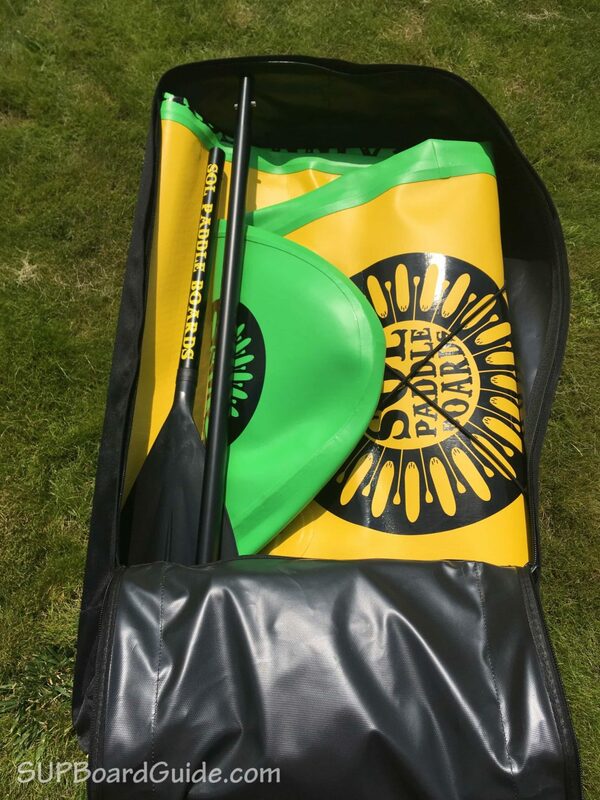 Along with the likes of the Thurso and now SOL, the inflatable SUP market is getting some heavy competition. You’ll notice there aren’t obvious negatives to point out about the SOLtrain. 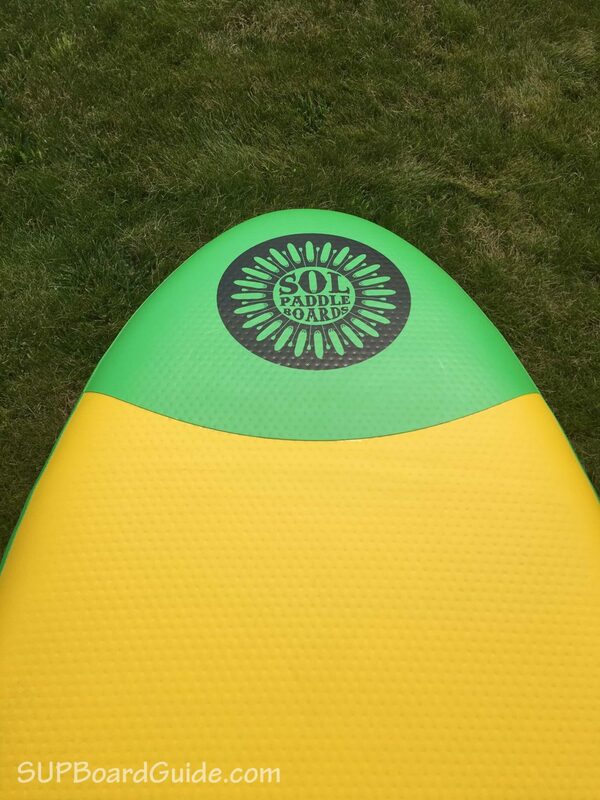 The aluminum paddle is heavier than fiberglass or carbon but does come with a few cool features. If you’re going to paddle board a lot, I always recommend upgrading to a carbon paddle anyway. Once you’ve touched a carbon paddle, you will never want to use fiberglass or aluminum ones again. One more thing I’ll note to keep this review 100% honest, is that when I weighed the board, it came in a little heavier than what it’s advertised (1lbs). Nothing over the extraordinary though and you see this kind of difference in a lot of boards. Of course, as you can tell purely by the title — the SOLtrain is best to be used as a multi-location, multi-use board. An all rounders intended use. You’ll get a great surf or whitewater ride out of your SOLtrain. Cruising in flat water will be a breeze, and choppy conditions won’t be an issue at all. You’ll probably only find more stability on a boat. Overall it’s definitely one of the best allrounder boards I’ve had the pleasure to test in 2017 and a definite buy recommendation. 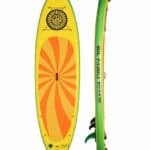 If you are looking to step it up whether it’s big waves, racing or other areas of expert SUP riding you will want to consider purchasing something else. 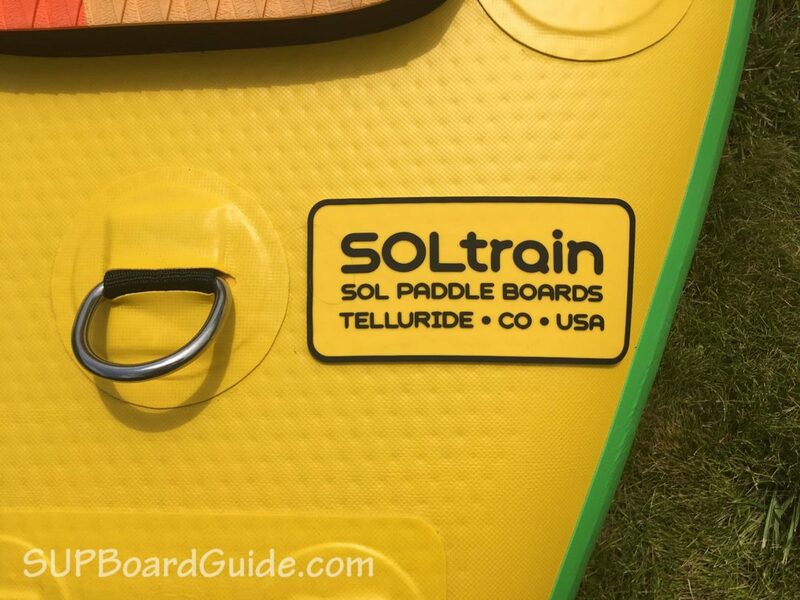 The SOLtrain company has produced a line of SUPs for all purposes. You can view them here and buy them on Amazon. Judging by the all-rounder, I believe SOL would provide brilliant boards across their whole range. 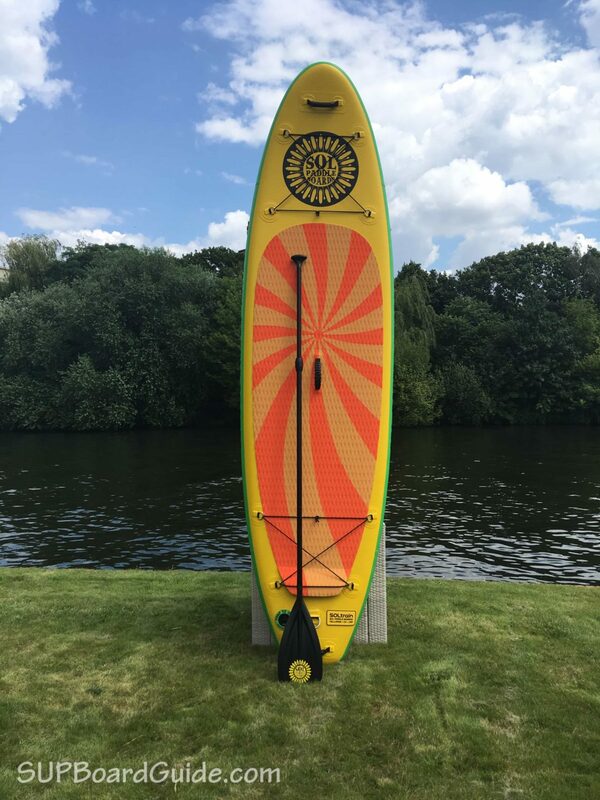 Otherwise, you can head over to our boards page where we describe what boards do what and some recommendations for each type of SUP.